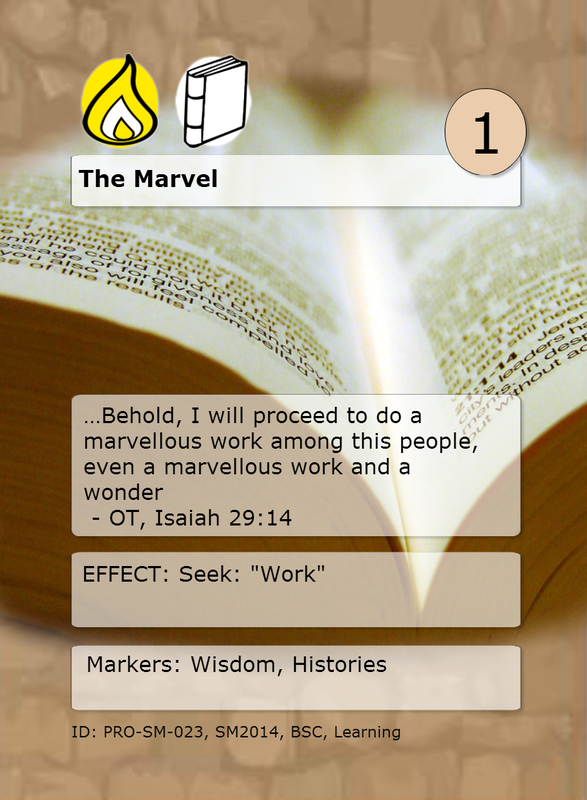 Verse Rule: EFFECT: Seek: "Work"
So, last week, I had a brilliant idea! The game mechanic that we had previously named “Keyword” should be named “Seek”! This is the mechanic that allows me to search through the verse texts in my deck for a particular keyword, then to put that verse into my hand. Since you’re seeking through your deck, it should be called “Seek”. It was such a clever stroke of genius! It would tie the game play even closer to the name of the game, The Seeker’s Quest, and it’s more descriptive of the action of the mechanic. What wasn’t quite so brilliant or such a stroke of genius about it was the fact that it meant that I had to spend lots of hours changing the graphics on about 1-2 dozen cards, a couple of which I had to recreate from scratch. THEN, I had to fix the rules booklets! So, to celebrate the change, the Verse of the Week is one of the ones that changed, The Marvel. It’s built on the verse in Isaiah that talks about the “marvelous work and a wonder” that is about to come forth. That verse is requoted several times in the Doctrine and Covenants as well. The work and wonder that it refers to is the restored Gospel, of course. LeGrand Richards used the phrase as the title to the book used as an introduction to the church, written when he was a mission president. This is a great way to seek out these two powerful cards and getting them ready to play so you can close up lots of books!